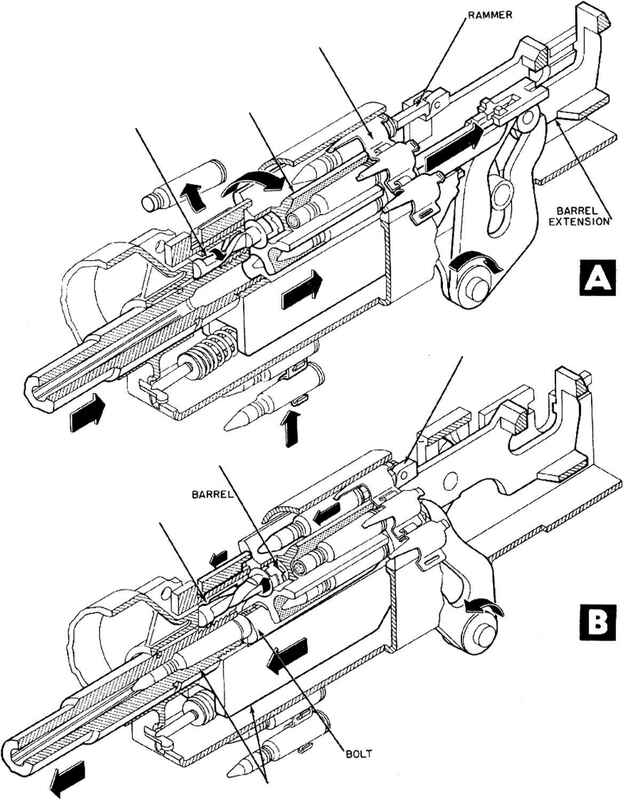 required to remove a cartridge from the feeder) can be treated in a like manner providing that the problem is considered in stages by methods similar to those described in the preceding paragraphs. Another useful curve for design and analysis purposes may be obtained by plotting bolt velocity versus displacement. This curve may be drawn easily because the velocity and displacement curves can be used to determine the velocity corresponding to any displacement. Fig. 1-19 shows the velocity-displacement curve for the gun of the example. In paragraph 2, it was pointed out that the selection of Fo and K for a driving spring will have a significant effect on the rate of fire. This may be seen by considering the. time to recoil for the extreme conditions in which (a) the initial compression is zero, and (b) the spring constant is zero and only a constant force retards the recoil.